Book review in Journal of Development Studies, by Marc Wheeler, Vol. 48, Issue 4, pp. 587-588, April 2012. Brand Aid named one of Choice‘s ‘Significant University Press Titles for Undergraduates 2010-2011‘ in the Journal of Scholarly Publishing, Vol. 42, No. 1, October 2011. 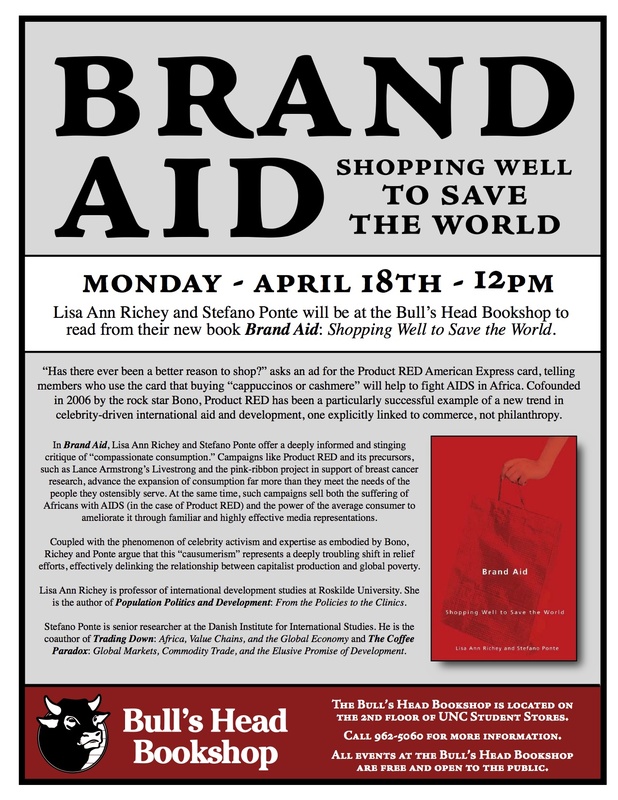 Foreign Policy Digest, by Mohammed Hamid Mohammed: FPD Book Review: BRAND AID. 18 May 2011. Danish newspaper Information, by Lotte Folke Kaarsholm: From Band Aid to Brand Aid (in Danish). 13 May 2011. The Chronicle of Higher Education, by Peter Monaghan: No Need to Volunteer or Engage -Just Buy. 3 April 2011. The Times Higher Education, by Isabelle Szmigin: Brand Aid: Shopping Well to Save the World. 31 March 2011. 18 October 2011: Brand Aid book launch at the Department of Management, Ca’ Foscari University, Venice. 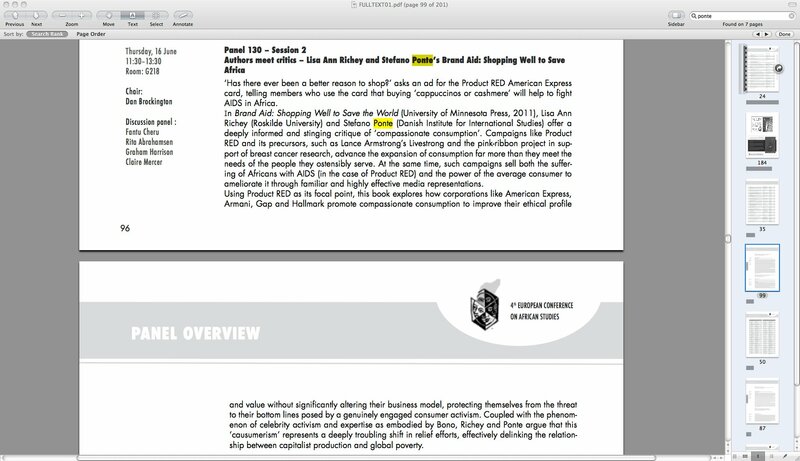 20 September 2011: Presentation on Brand Aid at the EADI/DSA conference in York. 30 June 2011: Brand Aid seminar at Dept. of Economics and Management, University of Padua. 16 June 2011: Panel discussion on Brand Aid at the 4th European Conference on African Studies, Uppsala. 13 May 2011: Book launch at Roskilde University Center (RUC). 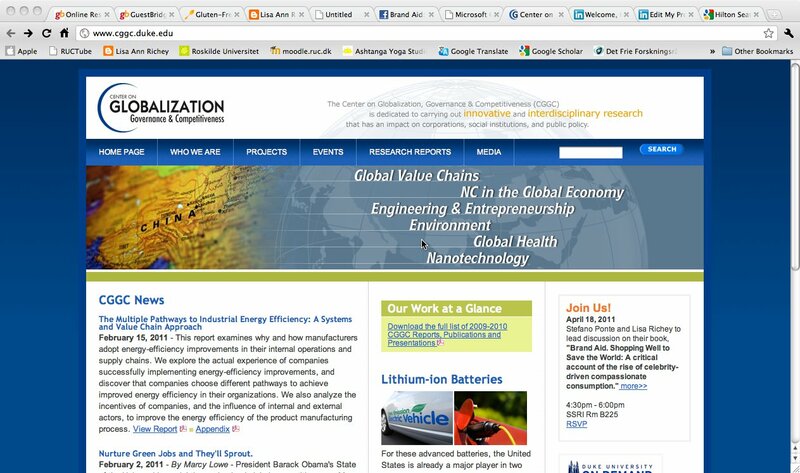 18 April 2011: Seminar on Brand Aid at Center on Globalization, Governance & Competitiveness, Duke University. 18 April 2011: Book launch at the Bulls Head Bookshop, UNC Chapel Hill. 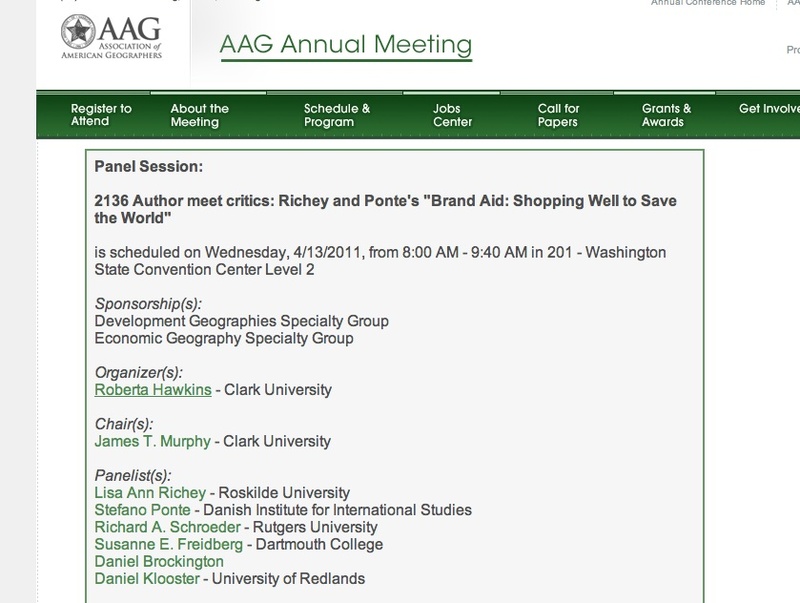 13 April 2011: Panel session at the AAG (American Association of Geographers) Annual Meeting, Washington State Convention Center. 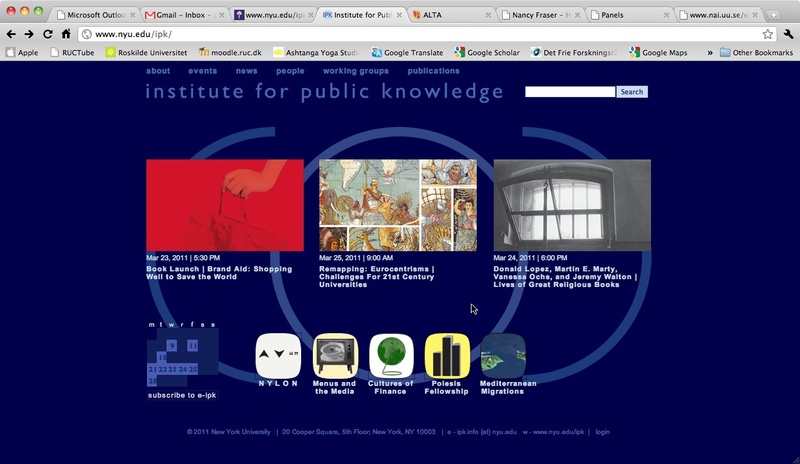 23 March 2011: Book launch at the Institute for Public Knowledge, New York University. 21 March 2011: Book launch, Institute for Advanced Studies, University of Minnesota. 19 March 2011: Panel session on Brand Aid at the ISA conference (International Studies Association), Montreal. 3 February 2011: Seminar at the Graduate School of Business, University of Cape Town. 4 February 2011: Seminar at the Institute for Poverty, Land and Agrarian Studies, University of the Western Cape. 20 December 2010: Seminar at the Institute for Development Studies, University of Sussex.